Happy Halloween everyone! I hope you all have a great night. Be safe out there! Miss A is going to be a fairy/butterfly. I got her costume at the last minute yesterday and it was totally meant to be because it was the last of everything (costume, wings, tights, headband). Lil Man is going to be Brobee from Yo Gabba Gabba. Hopefully I will get pictures of him later on tonight. I didn't do anything new with A's hair. I simply removed her two strand twist style from a few days ago. I didn't add any other product. 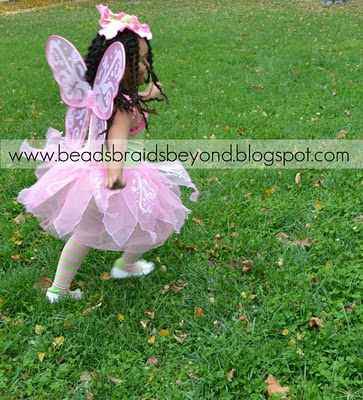 As you can see, her hair still looks fab thanks to Bee Mine Products (BBBFALL will get you 10% off your purchase!). 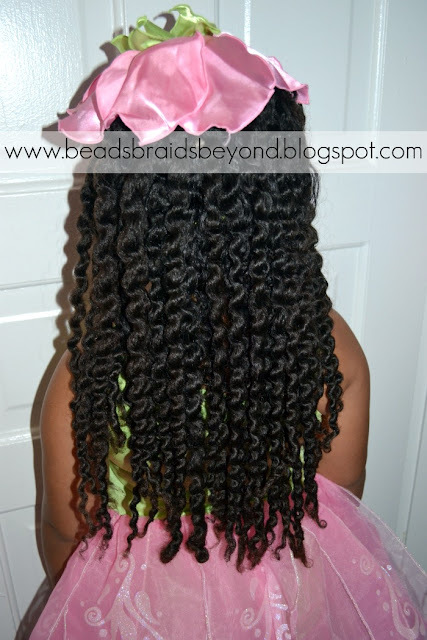 As you can see, her twist out shows a lot of length, this is because I twisted on dry, stretched hair (with product) and left it in for a few days. I'd love to see pictures of your little ones in their costumes! Feel free to post them over on our Facebook Page! She is so cute! Do you wet the ends of her dry twists to get them to stay twisted or will product alone keep them in place for a few days? She is such a pretty fairy. @Anonymous, I did not wet her hair. I did loosely wrap a rubberband around them this time but the rubberbands were so loose that many of them fell out but the twist stayed put. I just add the product and roll the ends between my fingers several times, that usually does the trick. She looks beautiful and her hair is just fabulous! 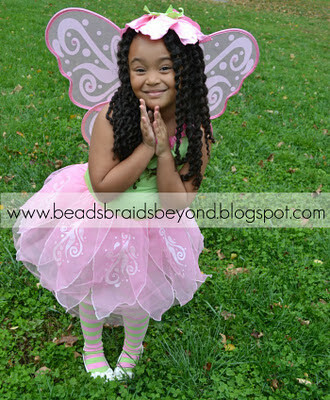 What a beautiful fairy!!! LOVE her hair!! It's always so beautiful! Hope y'all had a wonderful Halloween! 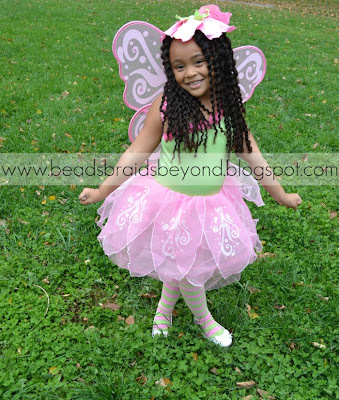 Love the costume and she is adorable...lovely twistout as well.